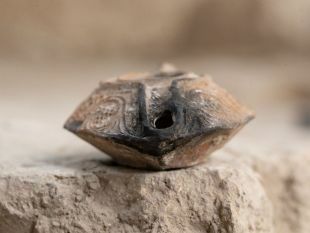 Archaeologists digging in one of the oldest areas of Jerusalem have found a tiny Islamic amulet through which a man named Kareem, who lived in the holy city more than a thousand years ago, sought the protection of Allah. Beautifully inscribed in Arabic, the rare thumbnail-sized talisman has been dated to the 9th or 10th century C.E., the time of the Abbasid Caliphate, the Israel Antiquities Authority said Thursday. The first line is familiar from seals and roadside graffiti along the Darb al-Haj, the pilgrimage route to Mecca, from the same period, around the 8th to the 10th centuries C.E. The second line has been slightly eroded and its interpretation is based on similar phrases found on personal seals and in the Koran. At its peak their empire stretched from North Africa in the west, covered the Holy Land and the entire Arabian Gulf, reaching Armenia, Turkestan and Afghanistan. In Israel, they ruled from the late 8th century to the end of 10th century, says Shalev. 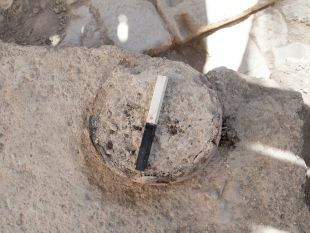 And among the relatively later layers of the Givati site, archeologists found the amulet owned some 1,000 years ago by this Muslim faithful called Kareem. The amulet was dated by Dr. Nitzan Amitai-Preiss of the Hebrew University of Jerusalem based on its calligraphy, which is typical of the third caliphate period; the dating of the structure in which it was found; and pottery fragments found at the site, including a complete lamp, which are typical of the Abbasid period. That structure was very poorly preserved, observes Shalev. “We found some foundation walls and floor tiles. It was a simple structure, possibly residential with some small industry.” Some cookware was discovered. 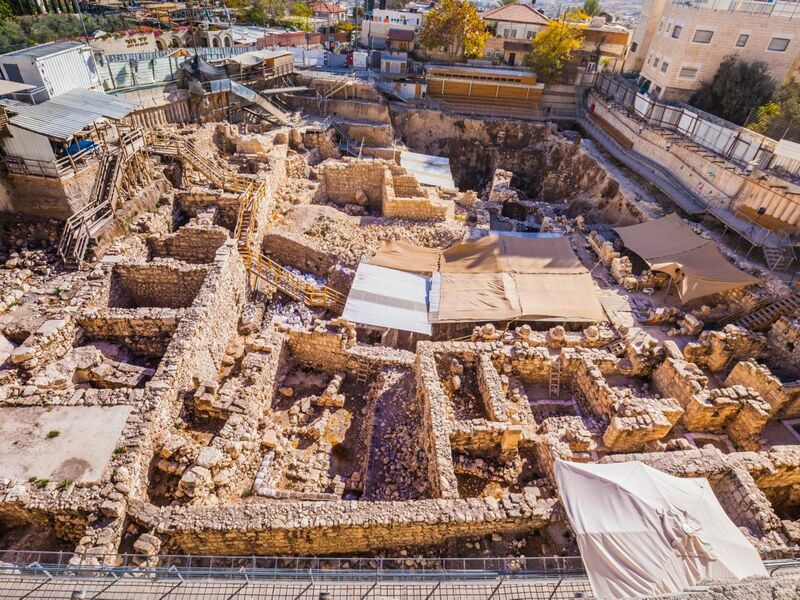 The dig at the site, led by the IAA and Tel Aviv University, had previously found the remains of a big market, on top of which later homes and small industry were erected, Shalev says. This possible home or workshop fits with that. The amulet – so finely made and small – may be one of a kind. Given that it is of friable clay, possibly there had been others like it but they crumbled over the centuries, Shalev says. This one may have survived because it lay sealed between plaster flooring. We cannot know whether the talisman was deliberately placed in the flooring during construction, as a sort of foundation offering (designed to protect the dwelling from divine umbrage) or whether Kareem lost it. However, if he wore the plea to the deity around his neck like a pendant, as people do to this day - it had to have been glued to a base: the amulet had no threading hole. Or if it did, it’s been lost in time. Jerusalem was not the Abbasid capital, but the city has been of vast importance to Islam from the early Umayyad Caliphate (the second after Mohammed's death) - because of the Temple Mount. People have lived in Jerusalem going back at least 7,000 years, throughout at least some of which Temple Mount was a sacred site, certainly before the major religions of today. 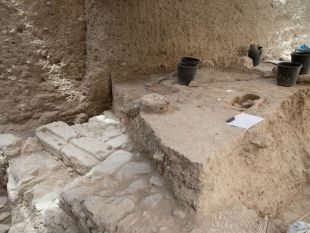 Prehistoric sanctity is apparently why ancient Jews and later Muslims built their monumental religious structures there. Jews believe Temple Mount is where God gathered the dust to make Adam, and where the patriarch Abraham tried to sacrifice his son Isaac. Crucially, it housed the Temple of Solomon (or First Temple), destroyed by the Babylonians in 587 B.C.E., and the rebuilt Second Temple, burned down by the Romans in 70 C.E. Islam also recognizes the area housed the Temple of Solomon but Muslims mainly worship it as the spot from which Mohammed is believed to have ascended to heaven. Today the Temple Mount, known to Muslims as Al-Haram al-Sharif, the Noble Sanctuary, houses the Dome of the Rock shrine, first erected by the Umayyads in the 7th century and rebuilt in the 11th century, and the Al-Aqsa Mosque, the third holiest site for Muslims. The Mount is also the holiest site for Jews, housing multiple remnants of the Temple - the most prominent of which is the Western Wall, part of the retaining wall built for the Second Temple mostly by the Roman vassal king, Herod the Great. Recent discoveries indicate that in contrast to the tradition, the Western Wall was only completed 20 years after the great king died.